That’s the first step to fixing everything from addiction to corporate malaise to malnutrition. A problem may look hopelessly complex. But there’s a game plan that can yield movement on even the toughest issues. And it starts with locating a bright spot — a ray of hope. Sternin had traveled to the country with his wife and 10-year-old son. None of them spoke the language. “We were like orphans at the airport when we arrived in Vietnam,” he said. “We had no idea what we were going to do.” Sternin had minimal staff and meager resources. The conventional wisdom was that malnutrition was the result of an intertwined set of problems: Sanitation was poor. Poverty was nearly universal. Clean water was not readily available. The rural people tended to be ignorant about nutrition. That analysis was, in Sternin’s judgment, TBU — true but useless. “Millions of kids can’t wait for those issues to be addressed,” he said. If addressing malnutrition required ending poverty and purifying water and building sanitation systems, then it would never happen. Especially in six months, with virtually no money to spend. 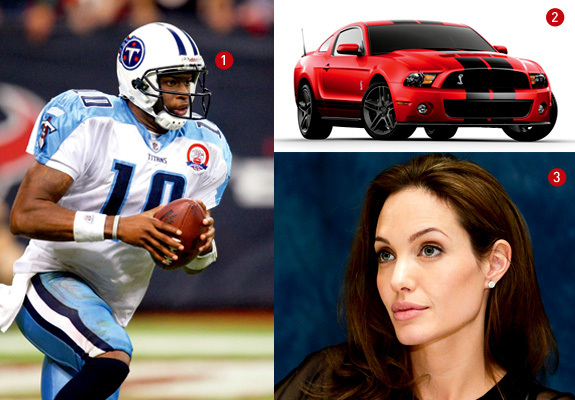 (1) Tennessee Titans quarterback Vince Young couldn’t handle stardom. Then he spent a year watching and learning how veteran QB Kerry Collins did his job. (2) Alan Mulally was CEO material but scored the top job at Ford only after identifying two key improvement areas with the help of an executive coach. (3) Actress Angelina Jolie triggered her transformation from wild child to humanitarian by moving out of Los Angeles and its culture of bad influences. Ignoring the experts, Sternin traveled to a local village and called together all the village’s mothers. He asked for their assistance in finding ways to nourish their kids better, and they agreed to help. As the first step, they went out in teams to weigh and measure every child in the village. Then, they pored over the results together with Sternin. Sternin’s strategy was to search the community for bright spots. If some kids were healthy despite their disadvantages, then that meant something important: Malnourishment was not inevitable. The mere existence of healthy kids provided hope for a practical, short-term solution. Sternin knew he couldn’t fix the thorny root causes. But if a handful of kids were staying healthy against the odds, why couldn’t every kid be healthy? Armed with that understanding, the mothers then observed the homes of the bright-spot kids, and, alert for any deviations, they noticed some unexpected habits. For one thing, bright-spot moms were feeding their kids four meals a day (using the same amount of food as other moms but spreading it across four servings rather than two). The larger twice-a-day meals eaten by most families turned out to be a mistake for children, because their malnourished stomachs couldn’t process that much food at one time. Perhaps most interesting, the healthy kids were eating different kinds of food. The bright-spot mothers were collecting tiny shrimp and crabs from the rice paddies and mixing them in with their kids’ rice. (Shrimp and crabs were eaten by adults but they weren’t considered appropriate food for kids.) The mothers also tossed in sweet-potato greens, which were considered a low-class food. These dietary improvisations, however strange or “low class,” were doing something precious: adding sorely needed protein and vitamins to the children’s diet. As an outsider, Sternin never could have foreseen these insights. He knew nothing about sweet-potato greens. The solution was a native one, emerging from the real-world experience of the villagers, and for that reason, it was inherently realistic as well as sustainable. But knowing the solution wasn’t enough. For anything to change, lots of mothers would need to adopt the new cooking habits. Sternin refused to make a formal announcement. He knew that telling the mothers about nutrition wouldn’t change their behavior. “Knowledge does not change behavior,” he told us in the spring of 2008 (Sternin passed away in December of that year). “We have all encountered crazy shrinks and obese doctors and divorced marriage counselors.” The mothers would have to practice it. They’d have to act differently until the different started to feel normal. The community designed a program in which 50 malnourished families, in groups of 10, would meet at a hut each day and prepare food together. The families were required to bring shrimp, crabs, and sweet-potato greens. The mothers washed their hands with soap and cooked the meal together. Sternin said that the moms were “acting their way into a new way of thinking.” Most important, it was their change, something that arose from the local wisdom of the village. Sternin’s role was only to help them see that they could do it, that they could conquer malnutrition on their own. Dozens of experts had analyzed the situation in Vietnam, agonizing over the problems — the water supply, the sanitation, the poverty, the ignorance. They’d written position papers and research documents and development plans. But they hadn’t changed a thing. Six months after Sternin’s visit to the Vietnamese village, 65% of the kids were better nourished — and they stayed that way. Later, when researchers from Emory University’s School of Public Health came to Vietnam to gather independent data, they found that even children who hadn’t been born when Sternin left the village were as healthy as the kids Sternin had reached directly. That provided proof that the changes had stuck. In tough times, we’ll see problems everywhere, and “analysis paralysis” will often kick in. That’s why, to make progress on a change, we need to provide crystal-clear direction — show people where to go, how to act, what destination to pursue. And that’s why bright spots are so essential: They provide the road map. (1) The Los Angeles MTA used humor to woo commuters from their cars. The ads increased citywide ridership to 29%, more than twice the national average. 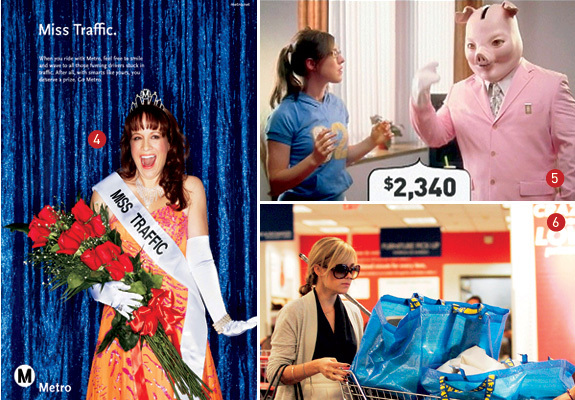 (2) The Ad Council’s “Feed the Pig” PSAs depict saving as a series of small choices, such as cooking at home. Viewers are 17% more likely to set cash aside. (3) Ninety-two percent of Ikea shoppers, such as ex-Hills star Lauren Conrad, switched to reusable totes after Ikea imposed a 5-cent fee for plastic bags. You may not be fighting malnutrition, but if you’re trying to change things, there are going to be bright spots in your field of view. And if you learn to identify and understand them, you will solve one of the fundamental mysteries of change: What, exactly, needs to be done differently? Consider the story of school counselor John Murphy and one of his students in Covington, Kentucky. Bobby was a ninth grader who was constantly late for class, rarely did his work, was disruptive, and sometimes made loud threats to other kids in the hallways. Bobby’s home life was just as chaotic; he’d been shuffled in and out of foster homes and special facilities for kids with behavioral problems. In a traditional counseling session, the therapist digs around for explanations — why are the patients acting the way they are? But Murphy was no traditional therapist. He practiced something called Solutions-Focused Brief Therapy. During his sessions with Bobby, he ignored the child’s problems and focused instead on how to remedy them. Here’s a brief exchange from one of their sessions. Notice how Murphy starts by trying to find a bright spot. Murphy: Tell me about the times at school when you don’t get in trouble as much. Bobby: I never get in trouble, well, not a lot, in Ms. Smith’s class. Murphy: What’s different about Ms. Smith’s class? Bobby: I don’t know, she’s nicer. We get along great. Murphy: What exactly does she do that’s nicer? Murphy wasn’t content with Bobby’s vague conclusion that Ms. Smith is “nicer.” He kept probing until Bobby identified that Ms. Smith always greeted him as soon as he walked into class. (Other teachers, understandably, avoided him.) She gave him easier work, which she knew he could complete. (Bobby is also learning disabled.) And whenever the class started working on an assignment, she’d check with Bobby to make sure he understood the instructions. Ms. Smith’s class was a bright spot, and as we’ve seen, anytime you have a bright spot, your mission is to clone it. Using Ms. Smith’s class as a model, Murphy gave Bobby’s other teachers very practical tips about how to deal with him: Greet Bobby at the door. Make sure he’s assigned work he can do. Check to make sure he understands the instructions. Over the next three months, Bobby’s rate of being sent to the principal’s office for a major infraction decreased by 80%. He also made striking progress on day-to-day behavior. Before solutions-focused therapy, his teachers typically rated his performance as acceptable in only one or two out of six class periods per day. After solutions-focused therapy, he was rated as acceptable in four or five of the six periods. Bobby is still not a model student. But he’s a lot better. 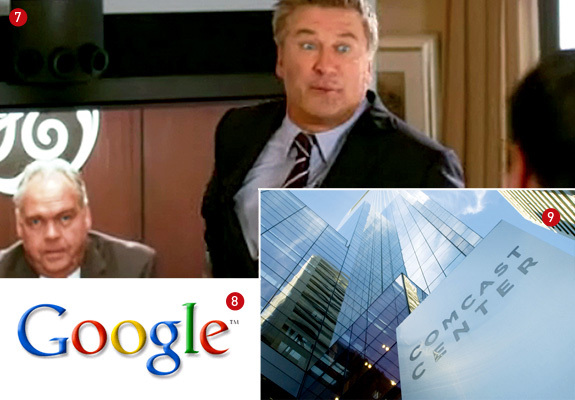 (4) Cisco’s TelePresence cameos on 30 Rock and 24 have helped the company break out of its rep as the Internet’s plumbers. (5) Google won greater employee loyalty — and motivated them to spend more time at work — by larding the Googleplex with everything from free meals to dry cleaning. (6) Comcast assigned Frank Eliason to talk to customers on Twitter after its service reputation sank. Eliason (@comcastcares) set the standard for fast, human interaction. Focusing on bright spots can be counterintuitive for businesses, as one of Sternin’s collaborators, Richard Pascale, discovered in 2003, when he accepted a consulting assignment with Genentech. The company had recently launched a drug called Xolair, which had been viewed as a “miracle drug” for asthma: It had proven effective in preventing asthma attacks for many patients. Yet six months after launch, Xolair’s sales remained well below expectations. Pascale and his team were asked to help figure out why Xolair was underperforming. They immediately started looking for bright spots, and soon they found one. Two saleswomen, who worked in the Dallas — Fort Worth area, were selling 20 times more Xolair than their peers. Further investigation revealed that rather than selling the health benefits of the drug — which doctors largely understood — the saleswomen were helping doctors understand how to administer it. Xolair was not a pill or inhaler; it required infusion via an IV drip. This was unfamiliar to the allergists and pediatricians who would be prescribing the drug. So did everyone at Genentech celebrate the discovery of the bright spot in Dallas — Fort Worth? Er, no. In fact, the DFW reps’ superior results were viewed with suspicion — managers assumed they must have had an unfair advantage. Perhaps their territory was too big. In other words, Genentech’s managers’ first reaction to the good news was that it must be bad news! That response is a good reminder that our capacity for analysis is endless. Even successes can look like warning flags to our problem-solving brains. But in times of change, it needs to be. Our rational brain has a problem focus when it needs a solution focus. If you are a manager, ask yourself, What is the ratio of the time you spend solving problems versus scaling successes? We need to switch from archaeological problem solving to bright-spot evangelizing. Take Jerry Sternin as your inspiration. He could have stayed in Vietnam for 20 years, writing position papers on the malnutrition problem. But what he knew was this: Even in failure there is success. A problem kid makes it through a single math class without getting in trouble. Two sales reps out of 50 sell like crazy. A few Vietnamese mothers, with no more money than any others, use their own ingenuity to raise healthy kids. These flashes of success, these bright spots, can provide our road map for action — and the hope that change is possible. This piece is adapted from Switch, which goes on sale February 16. Copyright 2010 by Chip Heath and Dan Heath. Published by arrangement with Broadway, a division of Random House Inc.